Hit the Heavenly powder in no time with the Stagecoach Express lift so close-by! The indoor/outdoor heated pool is totally perfect for playing Sharks 'n Minnows. There's no better ending to an epic powder day than a soothing apres soak. Swing by the Bear Trap Bar in the lobby after a long day on the slopes. Pack your racquet - the covered tennis court lets you work on your serve any time. Walk to the Stagecoach Express lift in just 13 minutes to hit the slopes at Heavenly. No more fighting for parking or waiting for shuttles - the resort has ski-in/ski-out access. Don't let the cold weather stop you from enjoying a swim in the outdoor heated pool, perfect pre-dinner activity! Book a hot stone massage or relax in the Eucalyptus-infused steam room at Elevation Spa. There are several outdoor hot tubs scattered throughout the property - hit the rooftop tabs for the best views. Grab your boots and a camera, Van Sickle State Park Trailhead is a 16 minute drive from the resort. Take your crew on a totally epic ski trip - minus the Tahoe price tag - with slopeside access by booking a suite at The Ridge Resorts. Tucked away on the Nevada side of the Heavenly Ski Resort, The Ridge has everything (literally everything) you need for your family ski getaway. An onsite ski and board shop is ready for rentals and tune-ups. After carbo-loading on a hot breakfast courtesy of your en-suite kitchen just mosey down to lobby to get your gear. Once everyone is fully outfitted and raring to hit the slopes, just pop outside and hop the Stagecoach Express lift up the mountain. Get ready to explore almost 200 trails across 4,800 acres of terrain, all while traversing the state border. There’s a reason they call this place Heavenly! As you and your crew shred the day away, keep an eye out for the DJ Cat - an old snow groomer turned traveling dance party that meanders the mountain during peak season. As the sun begins to set on the Sierras, rendezvous with the crew at the top of the Olympic Downhill run - the resort’s longest - and coast down the meandering blue all the way back down the mountain and right up to The Ridge. Come dinnertime, if nothing but a hearty home-cooked meal will do swing by the onsite Marketplace to grab the necessary ingredients. After the feast, see who’s up for a soak (everyone) and head for the hot tubs to let the massage jets work their magic on any sore muscles. One- and two-bedroom condo style suites are spacious and well appointed to help you feel right at home. A fully equipped kitchen fit for a foodie has everything you need to cook up whatever you’re craving. A living room with ample seating and a cozy gas fireplace makes an inviting space for quality time with the crew, though a TV in every room lets everyone have some me-time. A queen sleeper sofa in the living room and a cushy king in each bedroom comfortably sleeps families and friend groups of various sizes. Onsite dining abounds at The Ridge, from an elegant dinner at The Hungry Bear Restaurant to a casual meal at The Bistro. Homebodies can head to the Bear Trap Bar for happy hour drinks and tapas, or just grab light fare from the Marketplace to take back to the suite. If you went a little too hard on the slopes, book a massage at the onsite Elevation Spa, which boasts upscale amenities like a Eucalyptus Steam Room and Roman Soaking Tub. The Ridge Resorts also holds fun stuff like wine tastings, cooking demonstrations, snowshoeing - even a rock-climbing class! Looking for a night on the town? A complimentary shuttle will whisk you away to Lake Tahoe to browse boutiques, art galleries, and fine dining on the Cali side, or check out the casinos on the Nevada side. 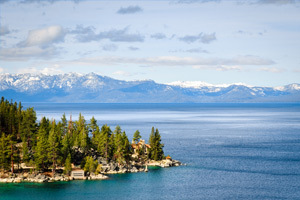 Tucked against the Nevada border on the southern shores of Lake Tahoe, enjoy outdoorsy sports and exciting nightlife alike. Ski the slopes at Heavenly Mountain Resort in the winter, or hit the lake in the summer. Feel like a night out? Hit the clubs, catch a show or test your luck at the casinos.